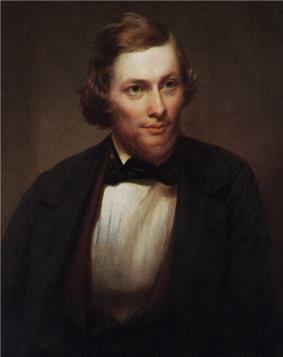 Jasper Francis Cropsey (February 18, 1823 – June 22, 1900) was an important American landscape artist of the Hudson River School. Cropsey married Maria Cooley in May 1847, traveled in Europe from 1847–1849, visiting England, France, Switzerland, and Italy. He was elected a full member of the Academy in 1851. Cropsey was a personal friend of Henry Tappan, the president of the University of Michigan from 1852 to 1863. At Tappan's invitation, he traveled to Ann Arbor in 1855 and produced two paintings, one of the Detroit Observatory, and a landscape of the campus. He went abroad again in 1855, and resided seven years in London, sending his pictures to the Royal Academy and to the International exhibition of 1862. Returning home, he opened a studio in New York and specialized in autumnal landscape paintings of the northeastern United States, often idealized and with vivid colors. Cropsey co-founded, with ten fellow artists, the American Society of Painters in Water Colors in 1866. In 1869 Cropsey built a 29-room Gothic Revival mansion and studio in Warwick, New York that he named Aladdin. As well as living in New York City, he spent part of his time in Warwick until the mansion was sold in 1884. In 1885 he removed to Hastings-on-Hudson, New York. Cropsey's home and studio, Ever Rest, in Hastings-on-Hudson, New York as well as the largest permanent collection of Cropsey's work are open for tours by the Newington-Cropsey Foundation. Jasper Cropsey died in anonymity but was rediscovered by galleries and collectors in the 1960s. Today, Cropsey's paintings are found in most major American museums, including the National Gallery of Art, the Metropolitan Museum of Art, the Los Angeles County Museum of Art, the Detroit Institute of Arts, the Timken Museum of Art in San Diego, the Honolulu Museum of Art, the Fine Arts Museums of San Francisco, the Denver Art Museum, the Princeton University Art Museum, and the Museum of Fine Arts, Boston. Works by Cropsey also hang in the White House. Cropsey and his wife Maria are buried in Sleepy Hollow Cemetery in Sleepy Hollow, New York. Cropsey's interest in architecture continued throughout his life and was a strong influence in his painting, most evident in his precise arrangement and outline of forms. But Cropsey was best known for his lavish use of color and, as a first-generation member from the Hudson River School, painted autumn landscapes that startled viewers with their boldness and brilliance. As an artist, he believed landscapes were the highest art form and that nature was a direct manifestation of God. He also felt a patriotic affiliation with nature and saw his paintings as depicting the rugged and unspoiled qualities of America. Some of his works include Jedburgh Abbey; Pontaine Marshes (1847); Backwoods of America (1857); Richmond Hill (1862); Indian Summer (1866); Greenwood Lake (1870); Lake Nemi in Italy (1879); Old Church at Arreton, Isle of Wight (1880); Ramapo Valley (1881); Autumn on the Hudson (1860): Wawayanda Valley (1883); Spring-time in England (1884); October in Ramapo Valley (1885); Autumn on Lake George, and A Showery Day (1886).